Ultra modern, ultra lightweight, sports style wrap. 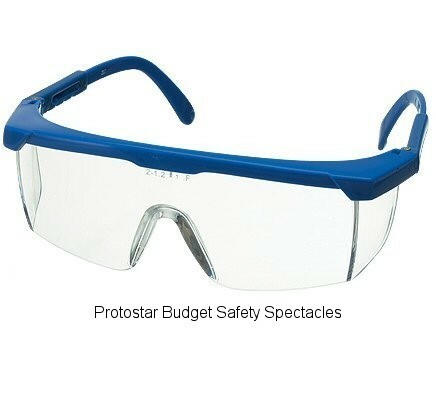 Ultra close fitting protection with panoramic vision. Adjustable temples and integrated side shields. Supplied with a free neck cord . 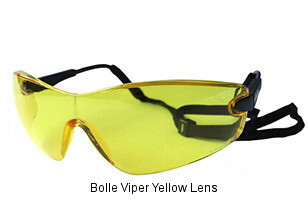 Available in Clear, Smoked, or Yellow lens options. Economical flip-up faceshield featuring browguard with head harness and 200mm polycarbonate visor. Visors can also be attached to safety helmets using the helmet adaptor. Made from tough clear polycarbonate with inbuilt side protection. Close fitting, anti-scratch, anti-mist lens. 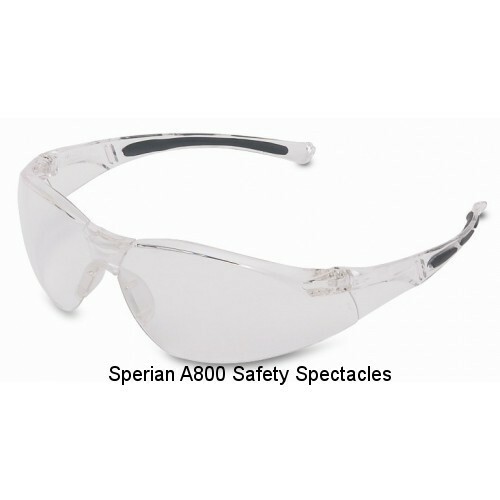 Sports style wraparound design affords maximum field of vision and comfort. Supplied with a free neck cord. Available in clear or amber lens options. 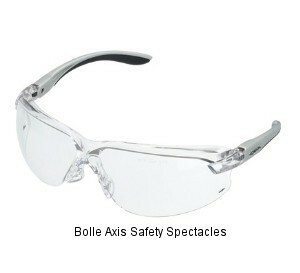 Bolle Axis Polycarbonate contrast / tinted Safety Glasses. Complies with EN 166/170 1F. 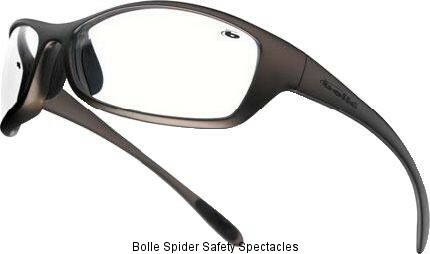 Panoramic field of vision offered in this lightweight safety spectacle. Trapezoid lens shape guarantees extra field of view and the lightweight nylon frame with TPE inserts on both the bridge and temples provides the wearer with exceptional levels of comfort and fit. Fitted with clear polycarbonate lens. Rated: EN 166 /170 1F. 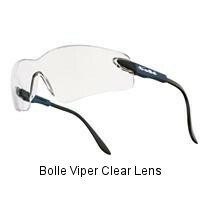 The Bolle Visiteur fits over standard and prescription spectacles and is made from polycarbonate lens materials for added strength and protection. 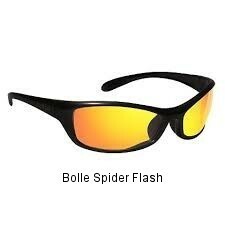 Ideal for people who have to protect eyes constantly or for just brief periods. Offers upper protection. 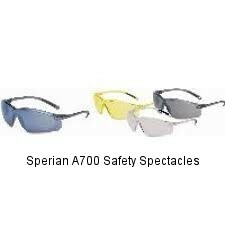 Sperian A700 Series are economical and stylish eye protection with sport temples for a fashionable yet comfortable fit. Sporty- wrap-around design. Provides protection against impact, sun, wind, dust and airborne debris, ideal for dirty high-particulate work such as grinding, chipping, shaving and sanding. Available with Dura-streme™ dual coating technology which combines anti-fog coating on the interior of the lens and anti-scratch coating on the exterior. Soft, flexible nose piece, can be fitted with soft temple tips or highly adjustable flame resistant headband. Sporty wrap around design for optimum wearer comfort and protection. 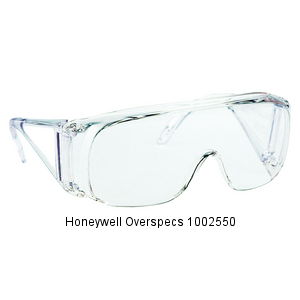 Unique permanent anti-mist and scratch resistant lens coating, for uncompromised safety and excellent value for money. 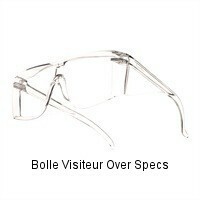 Compatible with uvex respirators. 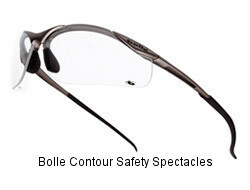 Ultra-thin lens for reduced weight, increased wearer comfort and sharpness of vision. Innovative lightweight materials and design - the side arms graduate from hard to soft material which gently grips the head for a secure stable fit. Reduced side arm profile gives excellent compatibility with other items of PPE. Manufactured to EN166. 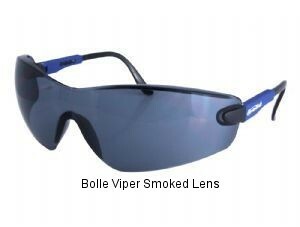 Blue frame, anti-scratch/anti-mist lens, adjustable arms, built in brow guard, light weight and comfortable. 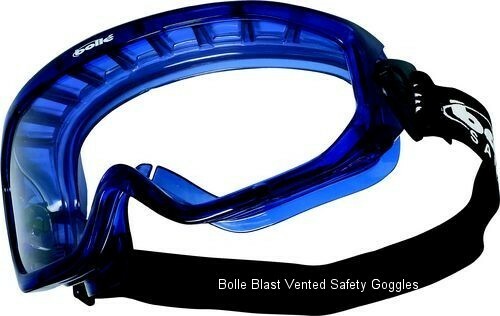 Polycarbonate, lower face shield that attaches to the Ultravision goggle for increased facial protection. Offers general protection, such as over-spray, not designed for medium energy impact. 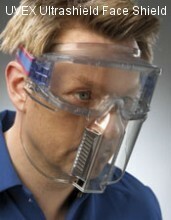 Will fit over disposable respirators. 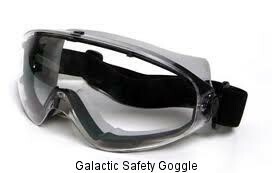 The unique shape of the goggle ensures a perfect fit with all respirators and with the face providing maximum comfort and protection, it has also been designed to fit over prescription spectacles. 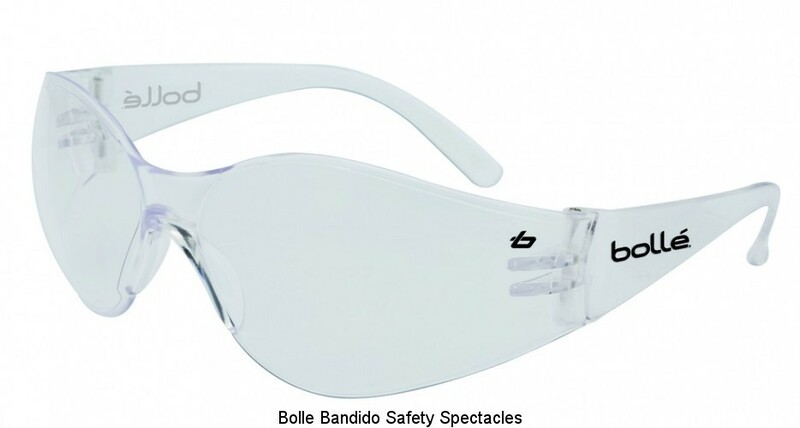 Fitted with a wide adjustable headband and an optical Class 1 anti-scratch and anti-fog vented polycarbonate lens the Blast goggle provides protection against impact, chemicals, dust, gas and molten metal. Tested and approved to EN 166 1B3459 CE. 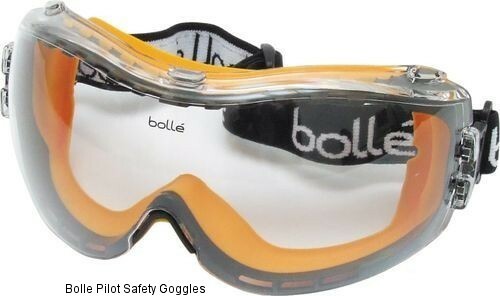 The Pilot safety over glasses have a ultra-flexible TPV housing and wide fully adjustable neoprene strap guarantees the wearer optimum levels of fit and comfort. The `toric` optical class 1 polycarbonate anti scratch and anti fog lens provides an excellent field of view and the lens can be easily and quickly changed. Can be worn over prescription spectacles. 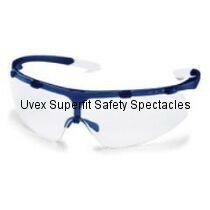 Uvex Clear lens cleaning tissues are specifically formulated for anti-fog and scratch resistant hardcoated safety glasses. The S462 silicone free classes cleaner can be used on its own, or as a refill to the S461 Uvex Clear permanent lens cleaning station. These non-abrasive tissues are a quality, cost-effective solution to your lens cleaning needs. 500/BX. 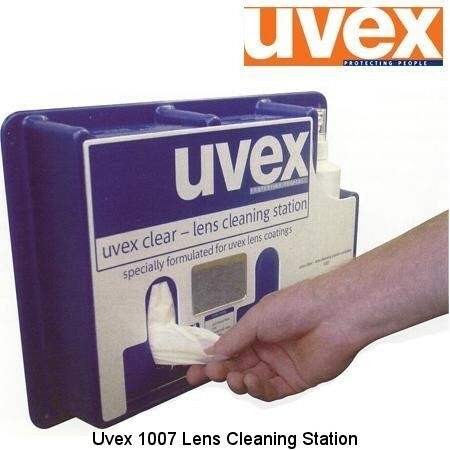 Uvex 9972-100 0.5 Litre Cleaning Fluid. Complete with cleaning solution and tissues. 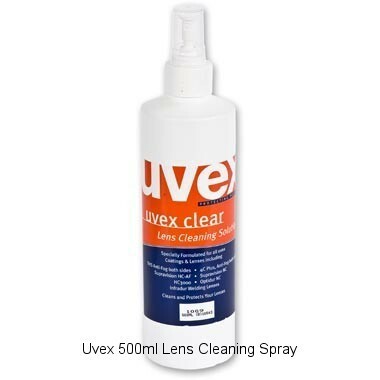 The Uvex clear lens cleaning solution is specifically for anti-fog coatings.